I never thought I’d see it, but it happens everyday here ~ reverse racism. We have roughly 70 Alabama Department Of Corrections employess and Officers and supervisors here and only 2 are white, and one is from Romania. Our Warden is black as well as our Captain and all supervisors. The black inmates as well as Officers can call us honkies and crackers and nothing is said. I stood in pill line and watched the black Officer make a white inmate walk all the way around the tables to get to her seat, yet a few minutes later, she let 2 black inmates take the short cut, the white inmate was denied and yelled at for trying to take. This same Officer made a white inmate get to the end of line for a minute to retrieve her ID and would not let her get her spot back. When there are disagrements between black and white inmates, Officers and Supervisors always side with the black inmates. Parole board has been granting parole to black females with violent crimes these past 3 years, but us white females with violent crimes have been denied parole and set off 5 years. No one is helping us and we are without hope at this corrupted facility ran by Alabama Department of Corrections. 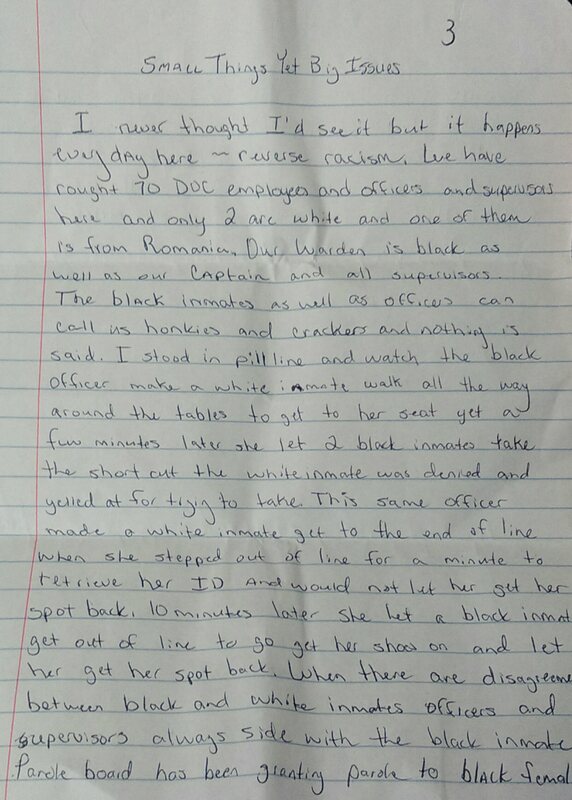 Transcribed by admin from a statement by an inmate , identity withheld as she is in fear of retaliation.